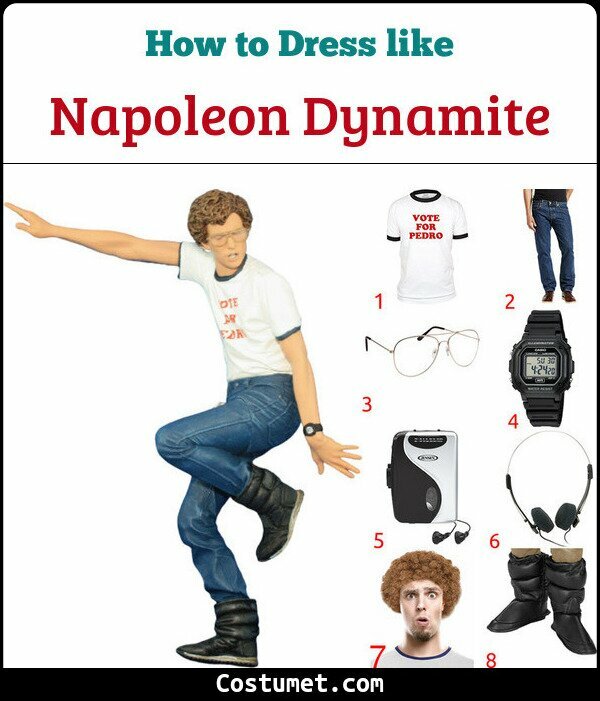 Napoleon’s style is a little outdated and nerdy, but definitely makes for an interesting look. He doesn’t dress quite like your typical nerd, but still gives a very nerdy vibe with his look. To honor and support his friend Pedro, who is running for class president he wears a white baseball style tee with the words “Vote for Pedro” written across the front. The pants he wears are terribly boring regular blue jeans, that go with his very simple nerdy look. He has a few accessories like a Walkman and vintage style headphones, as well as clear aviator glasses that make the whole look very goofy but in a fun way. He boots are incredibly odd and made out of a material that is puffy like a jacket, but in boot form. 1 T-shirt, white, graphic Napoleon wears this shirt to show support for his friend Pedro, who is running for student president. The “Vote for Pedro” line has become a modern icon for the Napoleon Dynamite movie. 2 Jeans, blue When you think of Napoleon’s pants, you might be thinking of the most boring, plain blue jeans ever; however, that is part of his nerdy charm. 3 Glasses, clear, aviator Because he has such bad eyesight, Napoleon must wear glasses. His glasses are these super nerdy vintage 70s inspired clear aviator glasses. 4 Watch, black, digital His watch is a vintage 90s style digital watch, that is actually quite cool and edgy. 5 Walkman, player Before smartphones, these Walkman cassette players were very popular, Napoleon uses his very often. 6 Headphones, vintage These headphones are in a style matching to the vintage cassette player. Both things are late 90s style and were popular during that time. 7 Wig, curly, ginger Napoleon has very unusual hair fashioned into a ginger-brown afro that doesn’t quite match his other features. 8 Boots, black, puffy His boots are a very weird style, and definitely not your typical black boots. They almost look like mini winter coats with their puffy style. Learn some dance steps for your party. Napoleon Dynamite is your average nerdy and secluded teen who makes a new friend one day in high-school. The movie is focused on Napoleon trying to help his friend win class president, while also dealing with his slightly deranged and dysfunctional family at the same time. He is played by American actor and producer Jon Heder. Mugatu wears a gray sweater with black details and his name in bold letters across his chest. He also has on a pair of black pants and black shoes.